Reviewing Authority: Accused admitted to striking the PW surgeon but only because the latrines were not clean and the PW surgeon was in charge of sanitation/hygiene; accused admitted to slapping and striking PWs forr taking clothing to the latrine and altering clothes. But, he never struck these individuals hard enough to require hospitalization or to even draw blood. He stated that he struck PWs to "correct their faults just as he had been struck when he took his training in the Japanese Army." Prosecution Arguments: There are no irregularities which injuriously affect any substantial rights of the accused; there is no evidence that the accused was not sane at the alleged time of the offenses or at the time of trial. The record is legally sufficient to support the findings of the commission. While the dates given by some of the affiants were in question, the other evidence given in each specification clearly established that the affiant was only in error about the year but not about the circumstances, acts and the accused as the perpetrator of the acts. 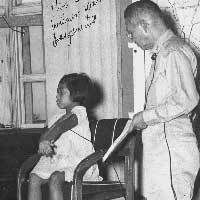 In response to the defense request that the court take judicial notice of the fact that corporal punishment was a feature of the Japanese army, the reviewer stated that "whether the punishment administered by the accused on the international prisoners of war was in accordance with Japanese standards, is entirely irrelevant....insofar as such standards and practices conflict with those established by international agreement, the former must yield to the latter." The evidence showed the vicious and cruel intentions of the accused in perpetration of these acts. Judge Advocate's Recommendations: Allan R. Browne, JAG: Comments about procedure made: alterations in the records were not initialed by the president, prosecutor and defense counsel. But, in such cases, "a statement may properly be appended, signed by the party initiating it, calling attention of the reviewing authority to alleged mistakes by the reporter." This, however, did not prejudice the accused in this trial.